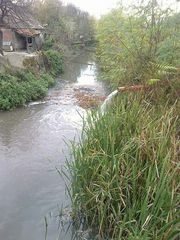 The Begejac channel is heavily polluted due to discharge of untreated communal waste waters and makes life impossible for people of the town of Kula. Kula is a small town situated on the Begejac channel, which is the part of the Danube-Tisa-Danube (DTD) channels system located in the north of Serbia. DTD is highly polluted due to the several decades of discharge of industrial waste waters and it is known as one of the environmental hot spot of Serbia. Pollution of the Begejac channel was exacerbated in 2006 when the public company JP „Vode Vojvodine“ allowed for discharge of the Crvenka village’s (10,000 citizens upstream from Kula) communal waste waters. Vode Vojvodine estimated it was lesser evil than to discharge it to other parts of DTD system. Since then, non-formal group of citizens of Kula organized petitions, public debates, protests and street marches to pressure the municipal government to influence the JP Vode Vojvodine, the Province of Vojvodina environmental authorities and the Serbian Government to solve the problem. They have been complaining of the smell and point out increase in cancer and respiratory diseases occurrence (no official study). The citizens have been asking for closing the channel into pipes, and even threatened several time they will bury the channel with earth. In response to this, the water management company diluted Begejac by pumping the clean water into it, and cleaned up one part of the accumulated sediment to speed up its flow. In 2008, the communities of Crvenka, Kula and Vrbas signed the contract for the joint project that include expansion of the public sewage system for three communities; construction of the collector of municipal waste waters; and the Central Waste Water Treatment Plant in Vrbas (CWWTP) for both municipal and industrial waste waters. In 2012, the construction of sewage system and remediation of polluted channel was delayed due to the government change and lack of political will. The finalization of the project was planned for the end of 2014, after which it would be necessary to proceed with re-mediation of the Begejac channel including removal and safe disposal of the toxic sediments. So far, the construction of the collector for municipal water from Kula and Vrbas (to be sent to CWWTP whose finalization is uncertain due to operational problems) was completed in Jun 2015, while the work on the sewage network in Kula started in March 2016 and should be finished in one year. Project Details Municipal waste waters of Crvenka with 10,000 citizens are daily emitted into the channel Begejac. Begejac passes through the town of Kula in length of 2,5km. The Central Waste Water Treatment Plant in Vrbas will have total capacity of load for 180,000 population equivalent. The extension of the sanitary sewerage collection system will include: 83,2 km of collection network, 30 km of transmission main and 22 small pumping stations. 30,000,000 USD- investments in Waste Water Treatment and Sewage Collection. Development of Alternatives Local people demanded resolving the problem of the channel Begejac pollution. They proposed closing down the channel into pipes to prevent the direct contact with the polluted water. Why? Explain briefly. The local water management company has pumped the water from the other channels to dilute the pollution, and has cleaned part of the sediment to speed up the water flow. The constructions of the sewage and the waste water treatment plant are to be finalized in 2017 that together with uncertain finalization of the central waste water treatment plant is expected to resolve the conflict. So far, there is no data on removal of the toxic sediment from the Begejac channel.